Boom 12,5 m - 39 m (41 ft - 128 ft) four section, full power MEGAFORM™ boom. Maximum tip height: 41,1 m (135 ft). Boom nose Four nylatron sheaves, mounted on heavy duty tapered roller bearings with removable pin type rope guards. Quick reeve boom nose. Removable auxiliary boom nose with removable pin type rope guard. Boom elevation Single lift cylinder with safety valve provides boom angle from -3° to +78°. Cab Steel constructed cab with acoustical lining, hydraulic tilt capability to +20°, tinted safety glass, adjustable operator's seat, opening side and rear windows, sliding skylight with wiper, and sunscreen. 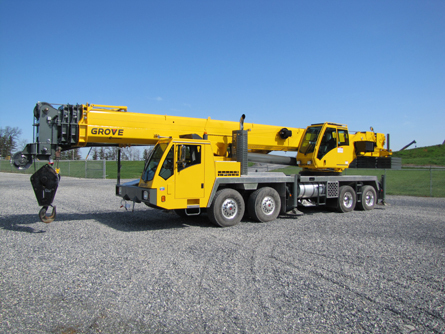 Other features include hot water heater and defroster, armrest integrated single axis electronic crane controls and ergonomically arranged instrumentation. Swing Axial piston fixed displacement motor and planetary gear box. Infinitely variable to 1.7 rpm. Holding brake and service brake. Counterweight 3629 kg (8000 lb) consisting of various sections with hydraulic installation/removal system. *Optional "Heavy Lift" package consisting of (1) 1814 kg (4000 lb) and (1) 2722 kg (6000 lb) section, for a total of 8165 kg (18,000 lb). *Optional "XL" counterweight package consisting of (1) 2721 kg (6000 lb) slab, (1) 1814 kg (4000 lb) slab and (2) 1361 kg (3000 lb) wing weights in addition to standard; for a total of 10 886 kg (24,000 lb) of counterweight. Outrigger system Four hydraulic telescoping, two-stage, double box beam outriggers with inverted jack and integral holding valves. Quick release type outrigger floats 610 mm (24 in) diameter. Three position setting with fully extended, intermediate (50%) extended and fully retracted capacities. 5th front jack with self-storing pad and automatic first-retract. Outrigger Monitoring System comes standard (required for North America and Canada). Maximum outrigger pad load: 46 176 kg (101,800 lb). Outrigger controls Located in the superstructure cab and on either side of the carrier. Crane level indicator (sight bubble). Engine Cummins QSM 11 six cylinder, turbo charged and after cooled diesel engine. 10.8 L (660 in3), 300 kW (402 bhp) at 1800 rpm. Maximum torque 1898 Nm (1400 lb-ft) at 1400 rpm. "Off Highway" Tier lll EPA, Carb and EU Stage IIIA compliant. Equipped with engine compression brake, audio-visual engine distress system and ether start aid. Fuel Requirement: Maximum of 5000 ppm sulfur content. Transmission Roadranger manual transmission with 11 speeds forward, three speeds reverse. Drive 8 x 4 x 4. Steering Front axles, single circuit, mechanical steering with hydraulic power assist. Turning radius: 13,7 m (45.1 ft). Axles Front: (2) beam-type steering axles, 2,12 m (83.4 in) track. Rear: (2) single reduction drive axles, 1,89 m (74.5 in) track. Inter-axle differential locks. Brakes S-cam, dual air split system operating on all wheels. Spring-applied, air released parking brake acting on rear axles. Air dryer. Tires Front: 445/65R 22.5 tubeless, mounted on aluminum disc wheels. Rear: 315/80R 22.5 tubeless, mounted on aluminum disc wheels, inner steel. Electrical system Four maintenance-free batteries provide 24 V electrical system. Standard battery disconnect.